2:10 pieces of tungsten carbide burr. They are in different shape likes sphere, cylinder or long nose, etc....... 1/8"(3mm) shank, 1- 3/4"(45mm) total length, 1/4" (6mm) head. 3:is recommended to use water as a lubricant when using these burrs. allowing them to be compatible with most die grinders and rotary tools as, grind and finish your work with precision. When the job or project is complete, you'll be happy to place your burrs back into the compact storage case so you can store. 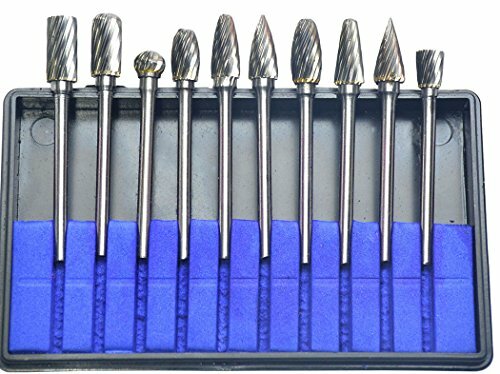 10Pcs Different shapes of drill composition,can be used with most hand power tools, including Rotary Tools, and many others. Technical data: Working diameter: 20mm,Maximum speed: 28.000 1/min,Shank diameter: 3mm. If you have any questions about this product by KOTVTM, contact us by completing and submitting the form below. If you are looking for a specif part number, please include it with your message.